It's time for one of my favorite quilt shows, held entirely online. 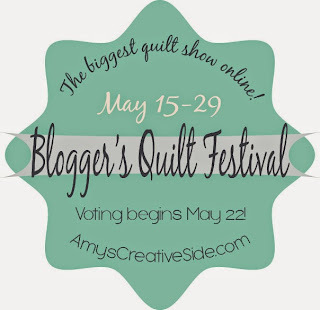 It's the Blogger's Quilt Festival hosted by Amy Ellis at Amy's Creative Side. I'm submitting Arrow Bird for the Mini Quilt category. If you want to make your own, you are welcome to download the free pattern from Craftsy. 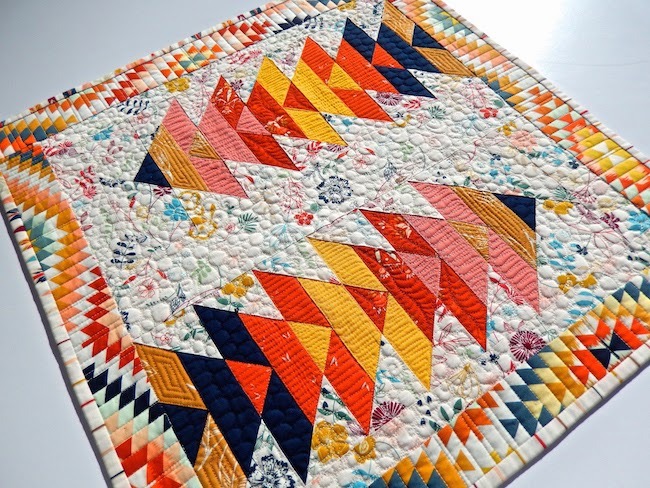 Arrow Bird was created for the Mini Quilt Mania! 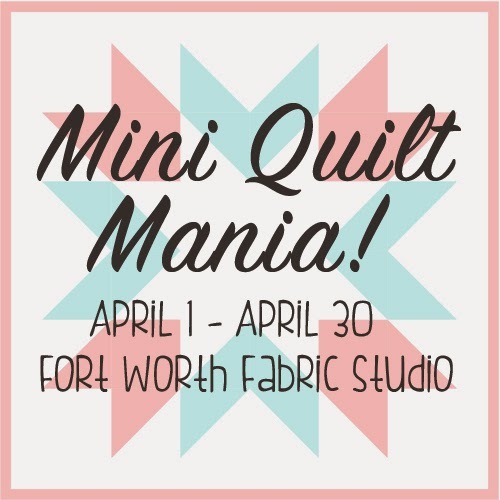 Blog Hop on the Fort Worth Fabric Studio blog. You can check out my post on their blog for all the specific details and a tutorial. This 18" x 18" paper-pieced mini includes April Rhodes' Wanderer, Maureen Cracknell's Wild & Free for Art Gallery Fabrics, and coordinating Kona solids. For the quilting, I used a different free-motion design for each fabric, pebbles in the background, and straight lines for the border. Now, let's have a glimpse at the reverse side. 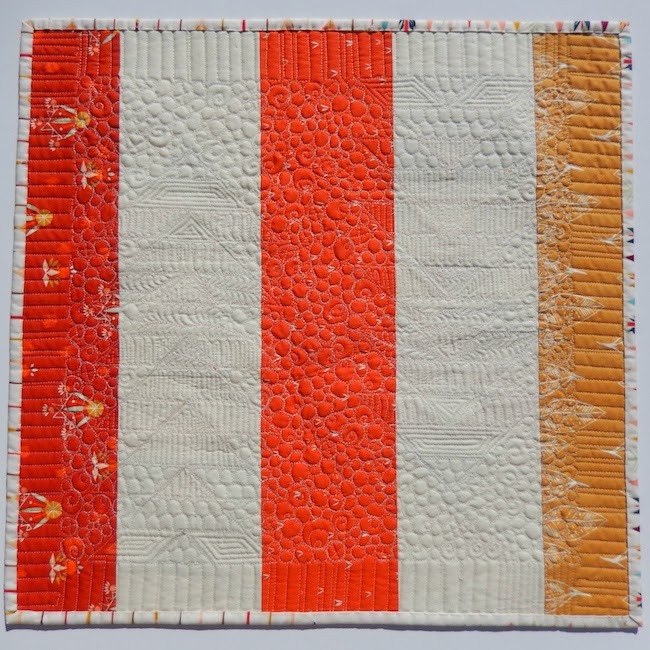 Don't forget to check out the Blogger's Quilt Festival. Entries are open until May 22. From May 22 until the 29th, voting is open. Winners will be announced on May 30. I love the back of this quilt at least as much, if not more than the front. Beautiful mini, love the idea of different quilting for each fabric. I really like this pattern and the prints you used. I made this when you had the tutorial on Fort Worth Studios and I really liked the instructions. So well written. I didn't have those fabrics so improvised from my stash. Yours is really outstanding!! Really great mini! Love those geese! Your Arrow Bird caught mt eye right from the start Afton - it's really fabulous! The Wanderer Serape fabric in your border actually looks pieced because of your quilting. I downloaded your free pattern and thank you very much for sharing it. Have a great time at the BQF! This is lovely and feels nicely southwestern. 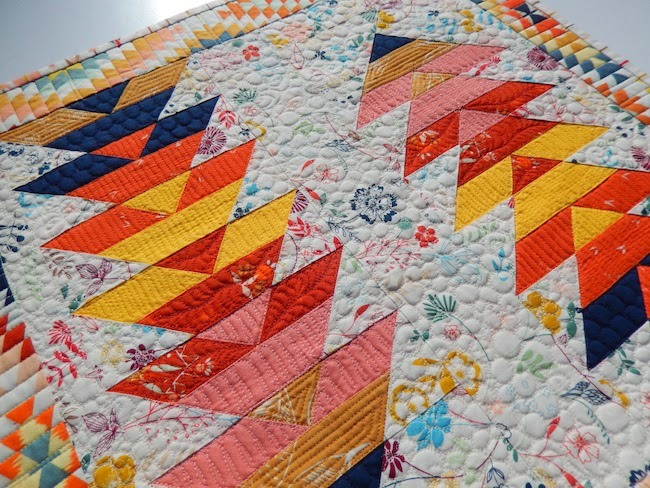 really fabulous mini - love the different coloured tips of the flying geese and the quilting is gorgeous ! thanks so much for sharing the pattern ! I love both your fabric choice and your quilting. The border is pretty amazing, too! The back is as pretty as the front! Your quilting on it is amazing. 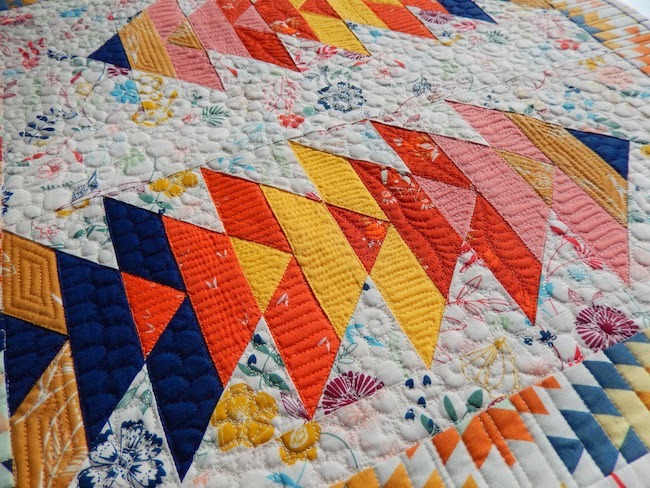 Amazing quilting and I love all the colours! Super cool. I love the way you did the edges. Great job.